Found in the size of matchstick heads, freckles do not cause a change in skin texture. 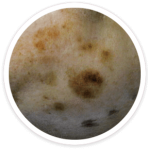 They are flat circular spots which are usually tan or light brown in colour. While freckles are an extremely common type of hyperpigmentation, they are more often seen among people with a lighter skin tone. 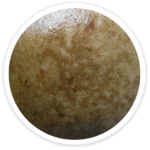 Unlike other types of hyperpigmentation, freckles may develop randomly on the skin especially on areas that are repeatedly exposed to the sun. Genetics: Freckles usually occur to one when he/she is young; it may even start appearing as early as one reaches two years old. With age, its appearance may become increasingly obvious. Though freckles removal is not necessary since it is not cancerous, freckles can make one look older than he/she is. Overexposure to sun: In a tropical country like Singapore, freckles can easily become a concern if one does not practice adequate sun protection. Long-term exposure to the UV rays from the sun can cause the surfacing of new freckles and the darkening of existing ones. Therefore, the best prevention is to make sure that you are applying an adequate amount of sunblock regularly. 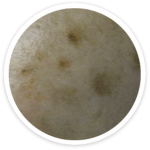 Commonly known as sunspots, solar lentigines are usually brown in colour and they do not cause a change in skin texture. 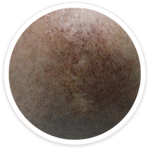 They are darker and more irregular in appearance as compared to freckles. Uneven skin tone and computer radiation spots. 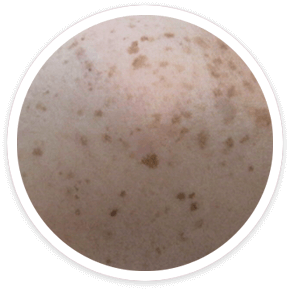 Usually tan, brown or black in colour, age spots are oval in shape and the size varies from freckle size to more than 13mm. It is also known as liver spots and they tend to develop on the face after the age of 40, indicating that the skin has entered its aging period. Developed from healed acne wounds, there are two types of post-acne pigmentation. 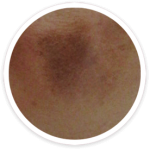 Marks which are reddish in colour are caused by broken blood capillaries that have yet to heal at the site of acne lesion. 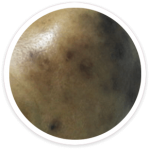 Developed through inflamed wounds, post-inflammatory hyperpigmentation is usually tan, brown or black in colour.